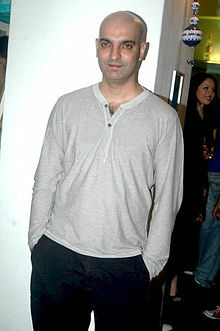 Abbas Tyrewala is an Indian film storywriter, screenwriter, dialogue writer and director. After making his mark as a screenwriter and dialogue writer in early 2000s, with award-winning films like Maqbool (2003), Munnabhai M.B.B.S. (2003), he made his debut as a director with a breezy romantic comedy, Jaane Tu Ya Jaane Na (2008). Born and brought up in Mumbai, Abbas joined St. Xavier's College, Mumbai for graduation, where he started working on plays and soon started writing advertising jingles, but he left without securing a degree to join Ogilvy & Mather PR agency, where he worked for a year; he then joined television production company Cinevista as creative consultant, which he left in 2000, to become a full-time writer. He entered the film industry as a lyricist, writing for film like, Dil Pe Mat Le Yaar!! (2000), and Love Ke Liye Kuch Bhi Karega (2001), till he got his break with Santosh Sivan's Asoka (2001) as a dialogue writer. He is married to Pakhi who had her debut in his film Jhoota Hi Sahi opposite John Abraham. Abbas hails from a modest background. Born to a poor Muslim family. Abbas's father owned a tyre repair shop, his mother, a housewife, was keen to get Tyrewala a good education in order to help him achieve. 2004: Filmfare Best Dialogue Award: Munnabhai M.B.B.S. 2004: Zee Cine Award for Best Dialogue: Munnabhai M.B.B.S. ^ "Abbas Tyrewala". NYTimes.com Movies & TV. The New York Times (All Movie Guide and Baseline). ^ "Abbas Tyrewala: Awards". Internet Movie Database.